I think it’s important to push yourself outside of your comfort zone, once in a while. 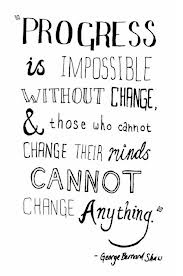 It forces you to adapt, cope, think on your feet and be comfortable with change. And most importantly, you learn new things. It’s easy to get comfortable doing what you know, and going with the flow, but in order to grow, you must make progress. I learned this yesterday at work, when asked to do something that I don’t have much experience doing. So my manager asked me to try it and we could review it once I was done. While I was worried that I would miss an important piece of information, I started putting my report together and realized that it wasn’t so hard after all. Of course, that doesn’t mean that I did it right, as we’re going to meet about it today, but I sent it to him to look over yesterday. I even joked with him asking him to let me know if I was on the right track…or even in the right stadium. He laughed and said, yes, I was in the right stadium, wearing the right jersey and even facing the right direction. The only person in my way of doing something was me. And with a little guidance, I’ll get there. I try to make sure my girls try new things, and understand that change isn’t always a bad thing. It’s okay to be afraid, but fear can’t be the reason NOT to do something. You have to try. It may not be so bad. In fact, it often leads to something good. Make a change today and make it a great one! So so true, I’m my biggest problem!